Hemingway’screative influences for novels like The Sun Also Rises, A Farewell toArms, and The Old Man and the Sea came not only from his famoushunting trips, his liaisons in Cuba, or his relationships with Gertrude Stein,F. Scott Fitzgerald, James Joyce and other Lost Generation writers. DuringHemingway’s period of greatest literary foment, his most seminal relationshipwas with Hadley Richardson, his first wife. 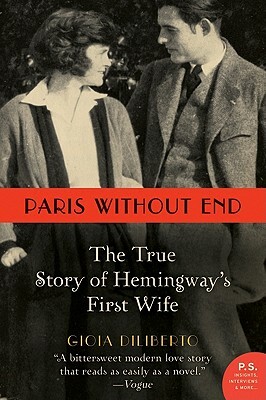 In Paris Without End,acclaimed author Gioia Diliberto,biographer of Jane Addams and Brenda Frazier, delivers a gripping, novelisticexploration of Hadley’s personality and her role in Hemingway’s life, finally unclouding our view of Hemingway’s relationship with theone woman he never stopped loving. Gioia Diliberto is a journalist, biographer, and novelist. She is the author of the biographies Paris without End: The True Story of Hemingway's First Wife, A Useful Woman: The Early Life of Jane Addams, and Debutante: The Story of Brenda Frazier and the novels I Am Madame X and The Collection. Her work has appeared in numerous publications, including the New York Times, Los Angeles Times, the Chicago Tribune, Smithsonian, and Vanity Fair, and she is a visiting lecturer in writing at the Savannah College of Art and Design and DePaul University. She lives in Chicago.